European politicians across country cases have deemed Islam, and Muslims, among the most pressing challenges faced by contemporary Europe. In spite of citizenship, Muslims remain marked as cultural others across the continent, and experience deprivation spanning socioeconomic indicators well into the 3rd and 4th generations. Drawing from 2.5 years of ethnographic research, interviews and archival research, this talk: 1) theorizes the stark and lasting marginalization faced by Muslims in Europe as a caste, and 2) explores the responses of two of Europe's largest mosque communities (The Sehitlik Mosque, Berlin and the East London Mosque) to this status. I argue that the concept of caste allows us to better understand the partial exclusion and partial inclusion (through subordination) of Muslims in Europe today, as well as historicize contemporary sociocultural conflicts over belonging. I further demonstrate how both mosque communities employ Islamic theology, specifically virtues, as a religion-based social response to marginalization, in one case, leading to increased incorporation into, and the other to increased segregation from, mainstream society. Elisabeth Beckeris a PhD Candidate at Yale University in Sociology, where she studies European mosque communities in comparative perspective. 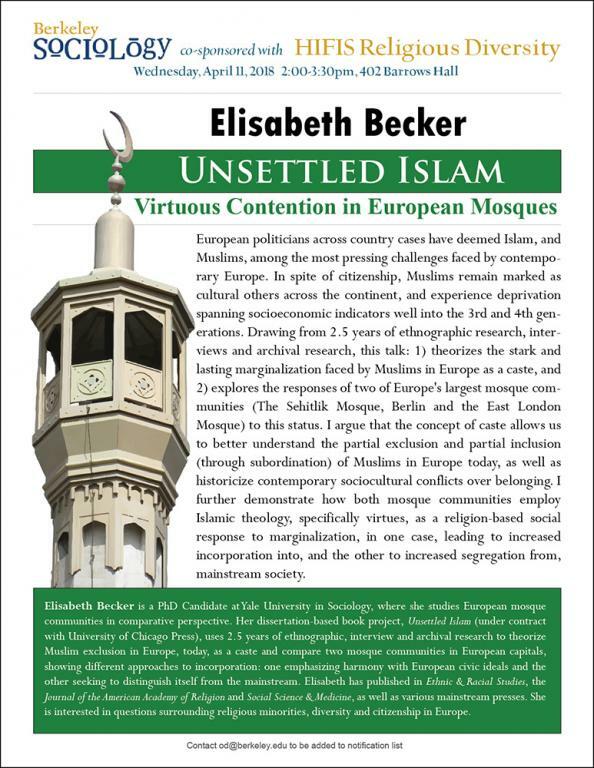 Her dissertation-based book project, Unsettled Islam (under contract with University of Chicago Press), uses 2.5 years of ethnographic, interview and archival research to theorize Muslim exclusion in Europe, today, as a caste and compare two mosque communities in European capitals, showing different approaches to incorporation: one emphasizing harmony with European civic ideals and the other seeking to distinguish itself from the mainstream. Elisabeth has published in Ethnic & Racial Studies, the Journal of the American Academy of Religion and Social Science & Medicine, as well as various mainstream presses. She is interested in questions surrounding religious minorities, diversity and citizenship in Europe.